A new initiative by Israel’s UN Ambassador Danny Danon has UN restaurants putting kosher food on the menu. After successfully convincing the UN to include Yom Kippur as a day of rest, holding a Seder in the halls of Turtle Bay, and hosting more than seventy ambassadors for a special showing of Fiddler on the Roof on Broadway, Israel’s Ambassador Danny Danon has set himself a new goal: kosher food in UN cafeterias. 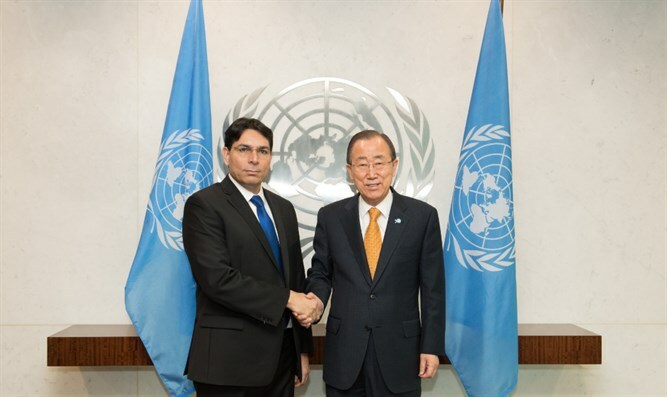 Ambassador Danon sent a letter to Secretary-General Ban Ki-Moon explaining that while there are many UN employees and diplomats from around the world who observe kosher dietary restrictions, kosher food is not available in any of the cafeterias or restaurants in UN headquarters in New York. “For many Jews around the world, eating kosher food is a fundamental aspect of religious practice,” wrote Ambassador Danon. “We believe that all citizens of the world should feel welcome in the UN,” he continued. In addition to noting the lack of kosher food options in the cafeterias, Ambassador Danon also requested in his letter that the Secretary General act to lower the high cost of kosher catering in the UN. The Ambassador noted that when catering official events, the Israeli Mission, which only orders kosher food, is limited to working with one approved supplier and is forced to pay a staggering 40% more than other missions which have a wide choice of caterers. Ambassador Danon requested that the UN allow additional kosher caterers to work within the organization’s headquarters, allowing competition and lowering cost.